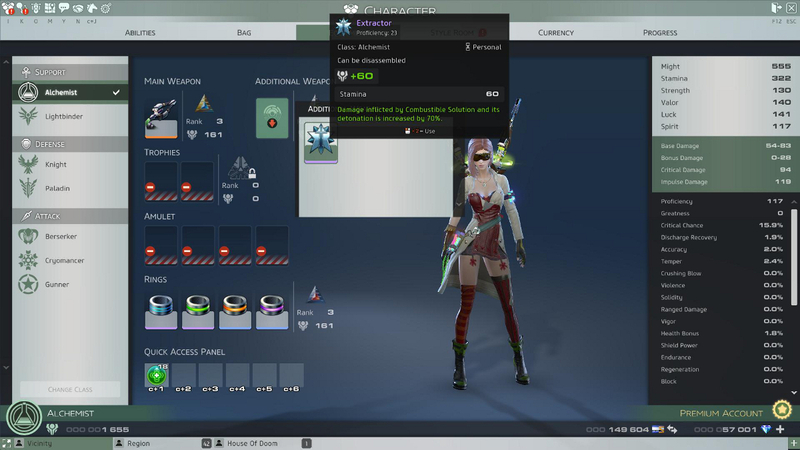 At the core of any worthwhile MMO is a detailed and compelling itemization system, and this is definitely the case with Skyforge. Where the game tends to deviate from the norm is by separating armor from the stat / power equation and keeping it purely in the realm of cosmetic costumes. That doesn’t mean you won’t still have plenty to consider when it comes to itemization, and how it impacts your stats and overall character advancement. 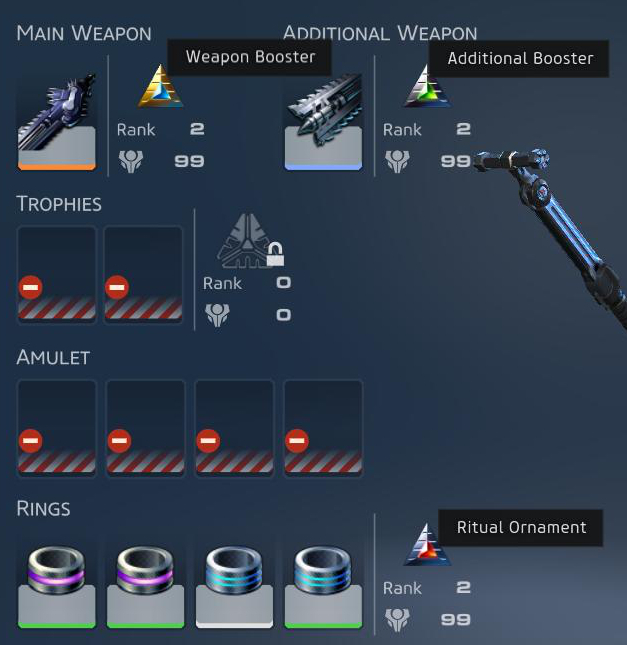 Each of your unlocked classes in Skyforge will have unique primary and secondary weapons (called Main Weapon and Additional Weapon in-game). You can change your active class at any time outside of combat, but you won’t have to worry about switching active weapons when you change your class. Opening up the Character window (I), select the Equipment tab from the options found towards the top of the screen. Click on the Main Weapon or Additional Weapon displayed in the center of the screen, and select a weapon from the available options from your inventory. Whenever you have better gear available in your bag, an orange arrow pointing down will appear over the associated gear slot. This will apply to weapons as well as other item types. It’s worth noting that only your weapons will be linked to a specific class – your other gear will be shared between them. Starting out, this will mainly apply to the four (4) ring slots, though you will also unlock slots for Trophies and Amulets over time. Rings can be equipped with no real restrictions via the same process of clicking on the slot and selecting an available ring from your inventory. Rings (as well as weapons) drop somewhat frequently as loot, so you’ll want to periodically open the Equipment window to see if any upgrades are available. As your overall Prestige increases, rings will offer increased benefits to stats, a greater impact on Prestige, and will often provide one or more additional benefits to your character. In the next section we’ll look at disassembling unwanted gear, and using Enhancement Stones to upgrade gear slots independently of the individual items you have equipped. You will often find that your bags are getting full with unwanted items, and will have a couple of options of how to manage your inventory. You can sell any unwanted items for Credits by opening up the Market (N) once it becomes available, and clicking on the Sell tab. Here you will find a listing of any items in your bags that are eligible. However, you will more likely want to disassemble most weapons and rings to gain Enhancement Stones. To disassemble an unwanted item, open your Character window (I) and select the Bag tab. Right click on the item, and select “Disassemble” from the list. Doing so will break the item down into Enhancement Stones which are a required component during the upgrading process. Please note that each time you gain Enhancement Stones through disassembling it will reduce your weekly credit limit by a small amount! 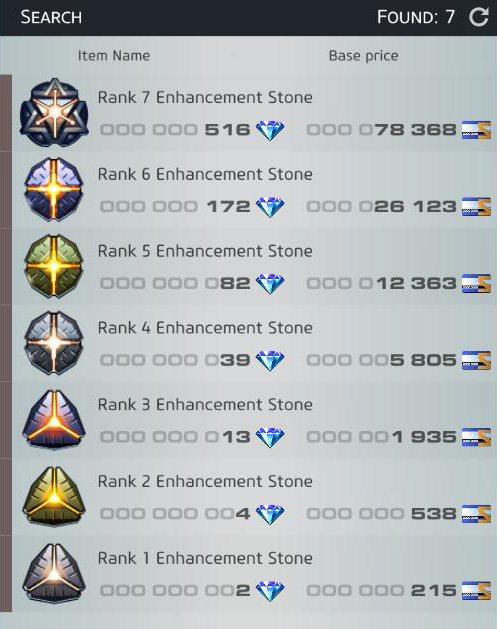 There are currently 7 Enhancement Stone Ranks available in the Market. Starting out, you will be focusing on collecting and using Rank 1 stones to upgrade your Main Weapon Booster, Additional Weapon Booster, and Ritual Ornament (rings). These will take you up through the first two ranks of upgrades, at which point you will begin using Rank 2 stones to progress. When upgrade requirements are met on one of these slots, you will be shown a green up arrow. Clicking on the triangle icon for the slot you would like to upgrade will open a new interface where you can see your current progress towards the next rank, and the required resources to upgrade. Upgrading to a new rank is a multiple stage process. First, you will be consuming a number of Enhancement stones and spending Credits to make incremental progress towards the next full Rank. Once the progress bar has reached 100%, you can then upgrade to the next full Rank by spending the required amount of Particles of Mastery. The required number of Particles will be shown at the bottom of the window, along with your overall number of available Particles (as shown in the image above). Particles of Mastery are obtained by completing adventures with a high rating, and can also be earned by completing all available quests in open map areas. 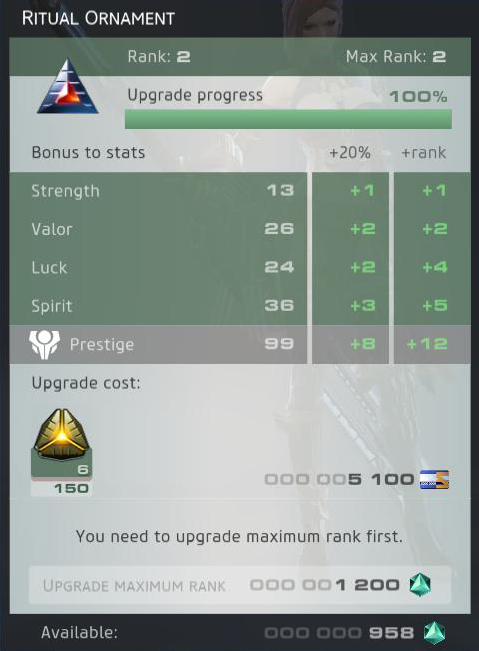 Upgrading will provide a boost to your core stats, and contribute to your overall Prestige rating, so you will want to be sure to upgrade your gear whenever you have the necessary resources.